Wow, what a day! I posted something earlier about the A9 right as it was announced and that page has all the specs of this new powerhouse camera. But for now, I wanted to record all of my thoughts of this new A9 while they were fresh in my head. PRE ORDERS START ON FRIDAY! !I WILL HAVE A FIRST LOOK REPORT WITH IMAGES AND MORE THOUGHTS THIS WEEK! CHECK BACK ALL WEEK FOR MORE A9 COVERAGE! Does the A9 offer eye focus like the A7 series? Yes indeed. I am sure all Sony cameras in the A line will from now on. I’m interested in start-up time. I’m not a pro-photographer but when something happens in front of me, I want a camera that is instantly available. My Nikon DSLR achieves this but my Olympus E-M1 does not. What’s the A9 like, starting from ‘cold’? Lack of weather sealing removes it from the professional category. Can’t shoot motocross, boating, etc. due to the severity of the environments. I wonder if this is a limitation of the current body design or a design decision for some other reason. Looks like a nice camera, but without that I don’t think it will supplant Nikon and Canon on the sidelines of the NFL for example. The tech is great, but I think Sony needs to get a few real-time professionals on its design and advisory board. Well, they had pro Olympic shooters test it and they were there to discuss their thoughts. All of them loved it, and will be using them. If you are going to be using it in hail and sleet storms and downpours, not a good idea. It is weather resistant like the A7 series. My A7R II has been through rain, sleet, snow, and a color run. Still works as new and never a hiccup. While I think they should have went all out with weather sealing, they must have had a reason not to. But if a few Olympic pro shooters praise it beyond belief, that’s good enough for some. Thanks. It’s also not just for sports shooters. I would upgrade from an A7II just for the EVF, and the battery life, and the AF improvements and the new thumb pad and the faster response and handling. It is in no way JUST for sports, it is for anything you want to shoot. Steve – I am certain it will make some inroads. However, it will have to go far to supplant the Canon line in the Pro category. While the tech is impressive, no one cares about it – it is the final image which is important. Canon has been doing this, and dominating for many, many years. It is a damn near perfect machine for most professional shooters. If I were Canon, I would be worried for sure as Sony has come on strong with a credible offering – though I sincerely doubt Canon is just sitting back on their laurels. There are some surprises coming in the not too distant future. Things are just starting to get interesting! Being a pro realestate photographer switching from Nikon d4s to sony a7ii some two years ago I have been eagerly awaiting a pro offer from sony. For me two things are crucial: double se-cards and a rugged weather-sealed body. I have used no less than4 a7ii bodies in two years, and struggle with many issues with each of them. So for me, this is a real let-down. IQ is already more than good enough! All the different technostuff I never USE, dont want more of IT! I want an a7ii in a pro body with double se-card slots. Give me that and i am all in. A9? No way! Not interested in buying two houses at 4500£ a year. paying for gimmicks i never use. I am so dissappointed with the a9 I am considering using My a7ii till IT drops before I switch to a different brand. Can you confirm that there is also a touchscreen. I’ve seen it in reports elsewhere, but there hasn’t been any real information about it. Is it just for the menus? Does it work the same way that the a6500 screen works (i.e., related to moving the focus points)? If so, is that overkill when a dedicated joystick is in place? Only to set the focus point. SO yes, and no. Something seemed familiar about the set for your video until I realized the couch in the background was where Tony & Chelsea Northrop did their video. The specs look amazing on paper, as they always seem to for Sony cameras. But I was hoping they would make the camera larger (e.g., SL size instead of A7 size). Yes Steve. This looks like a real dream camera, especially for action video enthusiasts. However, One question that was not addressed in all the new advanced coverage is why the sensor was limited to 24 megapixels. We saw some earlier speculation about a new 70 megapixel sensor in a refreshed A7RII model. Was this just pie in the sky? Is there a possibility that this will appear in the new A7 models? Hmm. Think about it. A7, A7R, A7s. Now A9..possibly..A9R, A9S… No idea but would make sense. For sorts or action or just about anything, 24MP is perfect IMO. But I would guess for more to come, and at a higher cost of course. I could see an A9r, but not until next year at the earliest. The more interesting question is if this is the form factor for the mk3 bodies coming? Steve: Can you report as to whether or not burst mode raw files downgrade to 12 bit. Or have they fixed that problem with the A9? Thank you! Same size is big disappointment. That’s my biggest grief with the A7 Series… they are way to small and littered with cramped controls. Now the A9 is aimed at the sports and action pro. Well then we are talking lenses like a 300mm F2.8 or a 500/600mm F4… ad this with an A7 sized body….. no thanks. They have a very well regarded grip with it. Why wouldn’t a working pro get the grip? I assume most will. Perhaps a strange request but I’d love video (or at least your impressions) of the blackout/refresh with the mechanical shutter enabled. I do a fair amount of work with strobes and so would still have to rely on the mechanical shutter. Just for portraits and family and travel; the A7Rii will give better IQ you think? Weddings (low light) – any advantage going for the A9 compared to the A7Rii? I am curious about the low light as well for weddings/receptions. How well does the auto-focus work in low light (my Nikon d750 does pretty great with this but wanting to switch over to the A9 instead, A7rii is horrible at this) and what ISO is decent to use. I will go to iso 6400 no problem sometimes higher with my Sony A7rii and Nikon D750 and am hoping for at least the same or better? How are the ports for remote shutter and HDMI accessed? The A7R2 is tough to access with (RRS) L Bracket in place. Hoping to see better access for cables, possibly f/o camera body. Low light sensitivity – is it as good as the A7SII? I think I’ll wait to see what the high megapixel variant has to offer before jumping on board. The a7RII has worked well as my sole camera body, but I’d love a back up. Honestly, I was hoping for higher resolution with quicker performance. Let’s see what else Sony has in store for us. I forgot to add that I LOVE the new location for the video recording. 😉 I’ve recorded video far too many times on my a7RII (it’s a shame they never allowed us to reassign that particular button in the corner). a9 seems to fix that minor quirk. Quicker performance? My gosh in what regard? I just ordered an A6500 and already wish I had this viewfinder and no blackout. The resolution makes perfect sense for the sports photographer they are targeting and is right where it needs to be given the competitions mp count. It does seem like the omission of s-log would indicate other models to come. Or a full frame video camera at NAB. Well, this is a replacement for the A7II as I see it. It is not just for sports. It is for ANYTHING you need. Weddings? Sure. Portraits? Sure. Landscape? Sure. Sports? Sure. I other words there are zero limitations here for the 1st time. Slog…well, this one shoots amazing 4K video as is, and Slog is used by few in the grand scheme of things (in the big picture). This is a photographers dream machine IMO. Nothing like it. Though I suspect they may do an A9s, and A9R. That would make sense if they followed the A7 plan. It isn’t just SLOG they cut. They removed all the Picture Profiles which also give you much better control over JPG rendering for stills and better dynamic range in video. The Creative Styles limit the dynamic range you can pull for a JPG in stills and video. Very frustrating limitation. Especially given that all their other ILC cameras included it! Well….there is no doubt the A9 is a replacement for the A7ii in every way as it relates to specs…but in no way as it relates to price. Let’s not forget it was size/price that got Sony into the FF race to begin with. The A9 looks awesome but I think Sony will need a cheaper FF option to be viable. I think its good for the system to have a halo camera and Sony has two parts of the holy trinity of event zooms with the GM 2.8’s. The new stacked sensor will make its way into other bodies and that tech will – in my opinion – be the major mk3 upgrade across the board along with the body/menu refinements and new batteries. For me its completely uninteresting outside of the body, dual cards, touchscreen, new battery and UHS-II (I complained about all that when the A7II and A7rII were released), but I shoot a lot of video and the video spec is uninspiring at best. AF upgrades look incremental after the big jump with the a7rII and a6500. After years of people complaining about the crappy video record button Sony FINALLY moved it. That and the battery, UHS-II, touchscreen and joystick at least show Sony is listening to complaints about their awful ergos. But only one UHS-II slot on a $4500 body when lesser bodies like the Xt2 have two? Come on man! Looking forward to the A7sIII (that crazy fast readout should eliminate rolling shutter) and A7rIII myself…. the camera is said to have a near distortion free shutter, but they don’t call it a global shutter. Also the max flash sync is at 1/250th sec, according to the specs. I’d love to see if one gets a fully exposed sensor at 1/1000th sec with the electronic shutter. If so, I’d make any hot shoe flash 4 times as strong in the sun. The A9 is still using a CMOS sensor with rolling shutter. The D70/D40 used CCD sensors that have what’s called a “global shutter” meaning all the pixels are read simultaneously. The A9 reads the sensor line-by-line but does it so quickly that in most instances there is no difference. The big exception, presumably, is still flash photography which is why the A9 still has a mechanical shutter (albeit turned off by default). Would you please test if it suffer from rolling shutter if u pan ridiculouly fast? 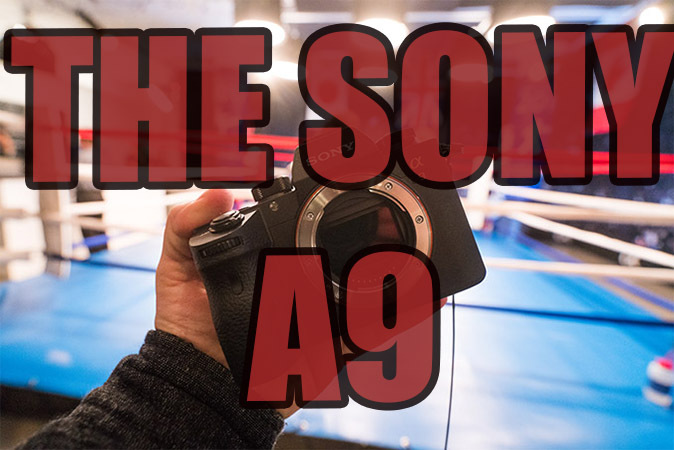 Does the A9 offer the same low light sensitivity that the A7s ii offers? I will test some of that today, but from what I hear it is somewhere between A7rII and A7II. So still around the same from what some of the pros who have used it already said. I would be interested to know if the playback and zooming in when reviewing the photos in the viewfinder is faster than the A7r2. Ahhh! Good one. Will check on it! Masses of DSLR gear is being listed on eBay as we speak. X-D Well okay it’s early days, so not quite yet. Mind you the A9 is way more camera than I need. Not that there’s anything wrong with that! I want to see an a9R, with tweaked & improved version of the a7RII sensor, with the same AF performance of the a9 but “only” 11fps burst rate (would make total sense as the processor will have to take in almost twice as much info). Completely weather sealed, and full S-Log 3 support. I saw one video review of someone who used the A9 today and got over 2,200 shots on one battery. My A77 II with 70-400 is also supposed to get horrible battery life but I’ve been able to get over 2,000 images over 4 hours at a college football game. I think Sony is being too conservative. So, if you’re not a pro and wanted to upgrade from a A7II and were thinking about the A7RII, would the A9 be overkill now that they have dropped the price of the A7RII? Do you anticipate that they will be coming out with a A7RIII? Also, are going to keep your A7RII? I have jumped into the Sony family (RX100III, A7II and the A6300) along with all of the Olympus EM series except the new EM-1M2. Just trying to figure out where to go from here. Well, if you want the best and fastest speed and response of any full frame camera, the A9 is it. The A7rII is still awesome as well. Just not as “refined” and nowhere near as fast for AF or tracking. I see the A9 excelling in all areas, even sports and action. The A7rII excels in everything but not so much action or sports ; ) IN other words, the A9 will meet or exceed the top Nikon and Canon pro SLR’s for AF speed and response. We’ll have to wait and see how the camera performs in the field. Lol. You guys wouldn’t know a better camera if it came and smacked you in the face. I thoroughly enjoy watching the status quo and their supporters squirm in the face of innovation. Rivers of salty tears. Actually, some of us would, because we make our livings with our cameras. Which is why we recognize the difference between reality and hyperbole. The camera looks great on paper, but take a more detailed look at those specs again. We’ll see how the camera actually performs in the field under professional conditions. Also, Sony has the worst customer support/service in the industry. This is well-documented. They need to address that. Hopefully they will. Looks like an amazing camera that will give Canon a run for their money, but I’m mostly happy with my A7rii and Pen-F. One thing that still annoys me about my A7Rii is why continuous shooting mode doesn’t work with silent shooting. Looks like they have implemented this in the A8. Could there be a firmware update on the way for the A7rii? Hey George, unlikely that the A7rII will get an update for that. I will see if I can find out anything on that but my guess is unlikely. Please tell us how fast the 100-400 autofocuses…for things like birds in flight. I used that lens yesterday and it was VERY fast indoors. That I can tell you. I will try to use it more today and will report back. Thank you. I’m having a hard time seeing the value of this camera over an A7 series body. That seems to me to be something they should have added to the A7mk III, rather than a much more expensive high end body. That is, something you would upgrade for, but certainly not worth the price difference between the cameras. One thing I would really like to know is how good the rolling shutter actually is. It doesn’t matter if you can shoot at 1/32,000 if the rolling shutter is going to skew the shot on something fast moving. MUCH faster AF, much faster AF tracking, dual SD slots, 2-3X the battery life, crazy amazing EVF (best there is), no blackout whatsoever (have to see it to believe it), better newer sensor, thumb pad, new controls up top that will keep you out of menus. This camera is a huge leap over the A7 series as far as response, usability, speed, and refinement. BUT the A7RII is still awesome as it is but once you try the A9…well, you would understand. The problem is the list of ‘must-haves’ are relatively limited. For instance, is the EVF good on the A7 mark II series? Of course. Also, better AF is always welcome, and that might be the biggest refinement there. But I kind of don’t agree that its a ‘huge leap over A7’ in refinement. The lack of explicit weather sealing alone disqualifies it from a camera of this price range, to me. It’s something Sony needs to jump on sooner rather than later, because the lenses also need to be up to snuff as well. The G-Masters should have excellent weather sealing, for instance. I definitely shoot mostly Leica glass on an A7 series body, so the AF advantages are lost on me. Even moreso, the AF lenses themselves that actually have fast performance are not attractive to me from a price or size perspective. But would I rather have an A7Sii and an A7Rii for about the same price as an A9? If I want a solidly built camera with no viewfinder blackout, wouldn’t I rather have an M10? Again, the value proposition is what’s missing here to me. As for more questions: how is the startup time, noise performance at high ISO, and how bad is the rolling shutter. These are all critical if Sony is serious about this being a pro camera. Sure, I can still use an EVF from cameras that are 4-5 years old. But if you want a better experience, and easier framing and to truly see exactly what you will capture then the newer EVF is SO SO much better than the one in the A7. As I said, like watching a HDTV up to your eye. No lag, no blackout, etc. But of course we can still use old tech and get shots. I believe this will be for pros who need the improvements to gain the edge and many enthusiasts who just want the best for the time. Battery life is for me, 2-5X the stamina, depending on how you shoot. That is huge. Instead of six batteries I can get away with one or two. Dual SD slots with a latch closed door. Feels nice and solid. Many have bee begging for these dual SD cards for 2 years. The AF is a HUGE leap from the A7 all in itself. The new controls up top are so much easier than going into the menu. The menu has been tweaked again, and makes for a nice clearer experience. Shoot up to 20FPS with 320+ continuous RAW or 700+ JPEGS. Slow motion dial up top. Just a flick of a dial will put you in 120 FPS mode for slow mo. There is even more but it is indeed a huge leap over the A7. When you shoot one you will see what I mean. With that said, it is not something that is NEEDED by amateurs or even enthusiasts. But it will make anyones shooting experience a nicer one. I will keep my A7rII for higher res and just to have around as I beat it to hell but I will be getting an A9 even tho I do not need it. Since the A7RII has been my most used camera, the A9 will take its place. The new sensor looks fantastic as well BTW. In any case this one will sell like hotcakes, thats my official prediction. Even at $4500 it will sell well. There is a huge market for a camera like this and they are already going nuts over it. Partly due to what it is, and the fact no other full frame 35mm format camera on earth can do what it does (for the pros), and partly due to the “wants” over “needs” of others. I’m no pro, but I want it. Do I need it? Nope. In reality all I need is my iPhone. No comparison to an M10 here, lol. Or DSRL. Again, this is in a different class. The Leica is gorgeous but for a different crowd who love the basic approach of all manual and an OVF RF. This camera is a tech tour de force and if one looks at this and drools, they do not want a Leica M.
I will most likely rarely use the 20FPS, and I was fine with my A7RII Af in 90% of situations. But what I love about it is when I use M glass? The EVF will give me a better than SL experience. I no longer will worry about my battery dying and dual SD cards for backup so if a failure occurs, I have a copy. For my personal uses, that is enough for me. If I ever need fast FPS or tracking, I have it. It is almost like a Mini SL without the true tank build, but its $2500 less than an SL and more versatile. This beats the Leica SL in all areas (except that build) and I had the SL above the A7rII. Not anymore. It is what it is. Not for all, but no camera is. Some will buy this and enjoy it, some will stick with what they have and some will switch from Canon or Nikon. It’s just more choice and that is always a good thing. Very cool camera, but not for me. I already have two FF digi cams at 24mp. I’ll take the upcoming A9R – with the improved EVF and a higher rez sensor as I care not about speed but detail as I’d be using it to scan film as well as take snaps. This camera shows where the market is headed – to higher spec and pricier stuff. First was the A6500 being a lot more expensive than the A6300. Then this A9 being a lot more expensive than the A7II. It’s the only way mfgs can make money now as the lower end has pretty much been ceded to smart phones. Personally I think it’s a win win for everyone. A D820 from Nikon will not be a good enough response..
and like big hefty cameras. No. A massaged 810 would not be enough. Nikon needs to bring out a mirrorless camera that will take the ton of Nikon glass that I have. I guess I have and endless appetite for new gear even though I’m quite happy with the A7R2 and E-M1 mk2. It is a judgement call as to whether the potential,enjoyment over what I have now would be worth the cost. Glad to see the 100-400 zoom. Have fun with your initial testing. Thanks Steve – you asked for requests – I’m not sure what you have with you adapter-wise but in terms of comparing it with an SL, some shots with some M mount lenses would be good, especially fast ones – how do the focus aids help with manual focus? Is the functionality/output the same as on an A7 Series? I will have to wait for a week or two for that one, when I get a loaner unit. That will be in my full review for sure. Does it still feel like shooting a with computer or is it more camera like– have they worked on the menus? Menus have been tweaked somewhat, will talk amore about it on Fridays post. It feels great shooting it though. Shutter release feels nice, and the AF is so impressive it really feels like a next level, especially for mirrorless. While I am not the biggest fan of Sony’s design choices, this is a camera that is capable of just about anything you would use 35mm for. Sports, Portraits, Weddings..anything. I think when there’s a ‘Need-For-Speed’, many Sony shooters bring out the A6300/6500. It would be great to know how the A9 AF compares to them. My A77II (12 FPS) is still faster than my D500 (10 FPS plus it is higher resolution. The only problem with the A77 II is the blackout between shots and the fact that you are looking at the previous image in the view finder which makes it difficult to follow fast, erratic action. No, after 5 years I never got used to it. Is weather sealing improved? My A7RM2 succumbed to dust and required repair. I mention this in the video..